The living room is smack bang in the center of things. Whether you like it or not, it’s a defacto centre of your home, so it needs to be a high level of “functional.” Your friends beeline, cocktail parties converge, and it’s probably where you spend the majority of your weekend. We want to feel relaxed in our living rooms. But how can our decor influence that? Foster those feelings with a clean, simple living room designs. By focusing on one (or two) main pieces, ditching the clutter, opting for calming color schemes and making the most of natural light, you can create a space that allows the mind to rest, and the people shine. 600 Square Feet and a Baby make the most of their space with the clean-lined Solae sectional. “Simple” doesn’t mean renouncing all of your stuff and living like a monk. But it does mean paring back the ‘busy’ in a room. Get intentional with every item. Remove ones that aren’t working. By curating so that all the pieces are streamlined, you can enhance the calming quality of the space. Next stop? Clear-headed contentment (and a couch you can actually sit on). 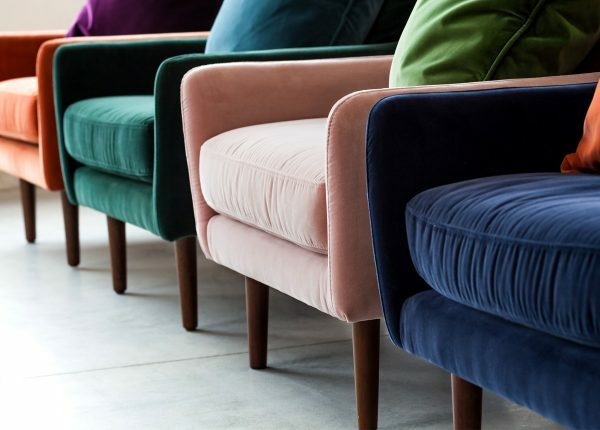 The couch doesn’t have to be the star of the show, but it will ground your design. Is this the year to replace it? Go for something with a breezy feel, clean lines and neutral colors. It can be expansive and loungey, like the superstars in the Solae series. Or sweet and shapely, like the exquisite Haro. Whichever way you lean, if you’re going to create a room where the couch is the centerpiece, make it one you love. The size of your space and the amount of people in your home will dictate the size. But simplifying your living room doesn’t always mean that you have to run out and buy a new couch. It can be as easy as clearing out the knickknacks. Which brings us to the next point. We love this shot from our recent Fresh Modern lookbook. 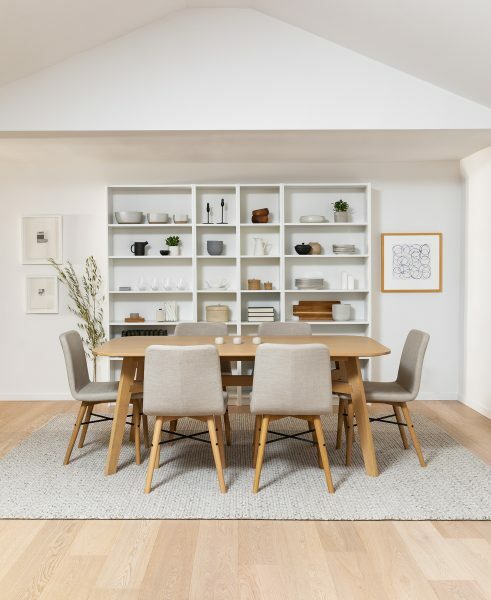 A neutral palette with lots of visual interest — like those sleek Kissa chairs, or that Ventu table. This is a big one. Mental clarity doesn’t jive with visual clutter. But some items will have to stay. Start by clearing the obvious clutter. Papers, magazines, dishes and any odd items that don’t belong. The rest? Consider adding closed storage to the room, like the modern, elegant Seno sideboard. It can house all those extra cords, board games, and books. Shut the door and done. What about stuff so pretty you want to let it shine? Use open shelving like the quirky, charming Caliper as a display, or create balance with a few key pieces on the coffee table. The Bios does double duty as a clutter keeper (see those secretive drawers? ), while it’s glossy white top can serve as a display area for a few favorite items. Natural light is the holy grail of any room. Capturing it properly works to open up a space. Assess your own space. Are you taking full advantage of it? This might be as simple as taking down any heavy drapery and opting for something translucent. Rearranging the furniture can also work to make the most of the light, and capture any views. You can also try moving furniture away from the wall and into the center of the room. Perennial fav the Matrix chair looking fresh and colorful. One of the biggest ways to create simplicity in the living room is to clean up the walls. We don’t just mean with a fresh coat of paint. Try removing all existing wall art, and then take stock of the room without it. This can give you an idea of what should stay and what should go. Feel the space really needs some visual interest, but you’ve culled your poster collection? Try adding a standing lamp or palmy plant. Or try texture to add some depth to a space. With a simple living room design, edit the texture down to one or two items. The natural, sturdy Tress basket brings texture to the room. If you have a neutral base you can afford some wild color decisions. 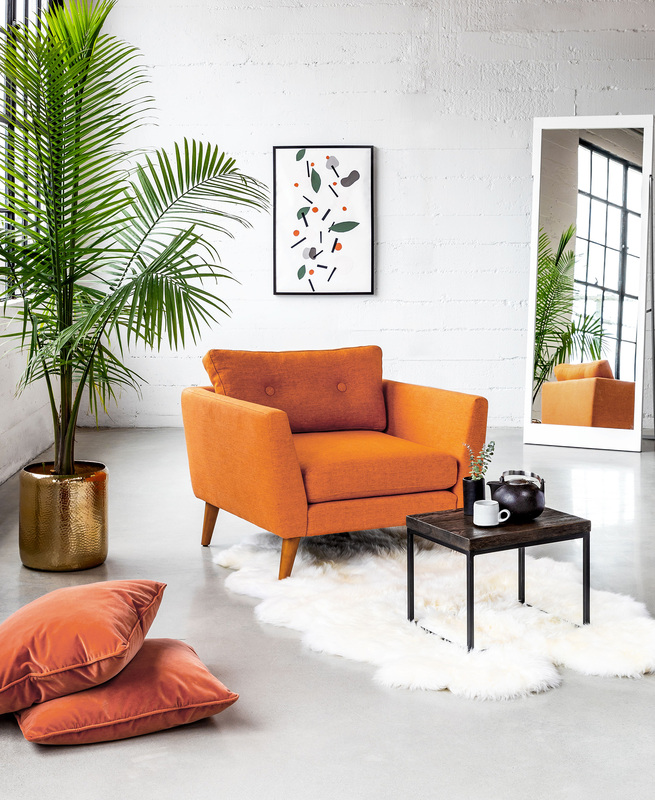 Try adding a pop of color with an accent chair. Like the aptly named Happy in a playful mauve pink. Starting smaller? Swap out the throw pillows. If you’re already playing with several colors, it could be as simple as removing one color group to get the rest in step. Working with a large room? Go for large, low slung modular pieces like the Solae collection. The beauty of modular furniture is that you can put together pieces to build a set that works in perfect proportion to the room. After you’ve got your grounding item in place, add your other items (lamp, coffee table, sideboard or shelving), bearing in mind that too much is … too much. Be spare. You’ll know your perfect balance when you see it. Ready for some star treatment, the Divan sofa stuns in the centre of this airy, bright space. Small spaces are great canvases for simple designs. An economy of space makes paring down essential. You can go for a neutral couch, like the tidy, earnest Nova sofa in grey. With your main piece in place, build out from there. Choose an accent color or two, like the subtle, calming blush pink of the Lucca throw pillows. Or in very small spaces, consider unexpected items as a coffee table. Going for a large sofa? Make sure that your coffee table is in step with the couch. A teeny tiny table with robust sized couch will look awkward. The linchpin of any simple living room design is the sofa. Take your cues for the other items from its size. The unshakable, trusty Mello paired with the unexpected sheen of the Bios coffee table? Perfect proportions. For more of a spare vibe, you can also pair glass coffee tables with larger furniture to keep the airy feel alive. 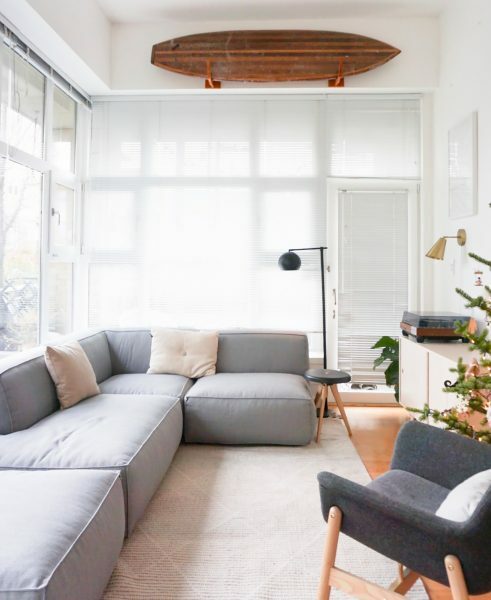 Pared back, simple living room designs create a room that’s purposeful. With clean lines, open spaces, a sense of order, and a tangible sense of harmony. Just in time for the new year.